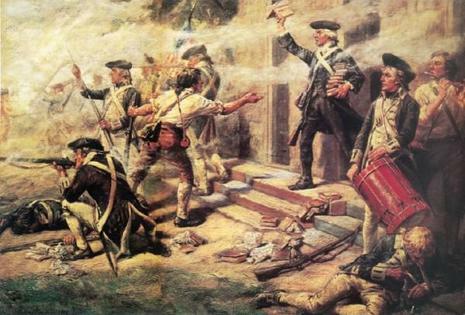 At four o'clock on the afternoon of August 8, 1779, Major Henry Lee, with four hundred infantry and a troop of dismounted dragoons started from New Bridge (now River Edge, New Jersey), on a march of fourteen miles through the woods to make an attack upon the fort at Paulus Hook. He detached patrols of horse to watch the communication with the North River and stationed parties of infantry at different roads leading to Paulus Hook. At Union Hill he filed into the woods where by the guide's timidity, or treachery, the march was prolonged to three hours before gaining the right road. 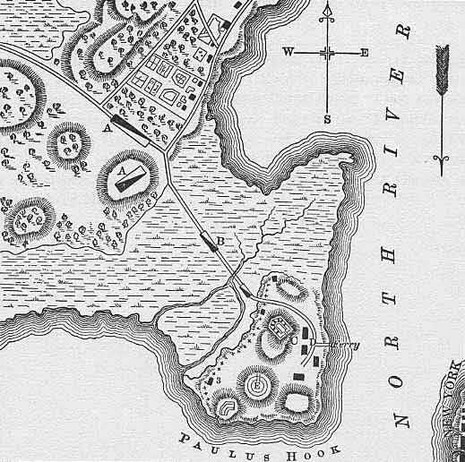 The same night, Colonel Van Boskirk left Paulus Hook with a force of one hundred and thirty men to make a raid upon the English neighborhood. Fortunately the two parties did not meet. Major Lee and his men reached Prior's Mill at 3 am, August 19, 1779; at 3:30 they reached the ditch at the intersection of Newark Avenue and Warren Street. The tide was rising but Lieutenant Rudolph found the canal fordable, and led by Lieutenants McCallister and Rudolph the troops pushed through and soon gained possession of the outer fort. Major Sutherland, who was in command of the fort, retired into a small redoubt with a few officers and forty Hessians. It was nearly daylight and Major Lee had no time to dislodge them. He had intended to burn the barracks, but on finding sick soldiers, women and children in them he refrained. He retreated, carrying with him one hundred and fifty-nine prisoners, officers and men he lost two men killed, and had, three men wounded. Captain Forsyth was ordered to Prior's Mill to collect such men as were most fit for action and take a position on Bergen Heights to cover the retreat. This position was in the woods near Bergen and Sip avenues, said to be about the site now occupied by Dr. Hornblower's house, 631 Bergen Avenue. Dr. Hornblower's grandmother was then a little girl, Anna Merselis, and that morning in looking for a cow, she came upon Lee's soldiers, who detained her while they waited, to prevent her carrying any report of their presence to possible enemies. The troops remained there until messengers had been sent to ascertain if the boats that Major Lee had arranged to have in waiting for him at Dow's Ferry were there. He had intended to cross the Hackensack River and by the Belleville Turnpike reach the high ground east of the Passaic River, and thus return to New Bridge; but the boats had been removed to Newark, New Jersey and Major Lee with ruined ammunition and tired men, encumbered with prisoners, was obliged to return by a route liable to be interrupted by troops from New York City. With undaunted courage and wise precautions the brave troops started on the return march of fourteen miles to New Bridge; at "Weehock" (today's Weehawken) Captain Catlett came up with fifty men and good ammunition. At the Fort Lee road Colonel Ball met him with two hundred fresh men, and Major Lee and his men safely reached New Bridge about one o'clock in the afternoon. The English were greatly annoyed and the Americans exceedingly jubilant over the affair.